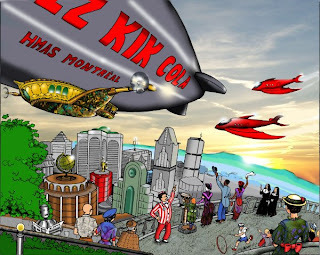 Books & other thoughts: Off to Montreal for the 67th World Science Fiction Convention! Off to Montreal for the 67th World Science Fiction Convention! Woohoo! I haven't been since I started making my way through library school at a one-course-per-semester snail's pace. But now that I've graduated and have my life back (and don't have hefty tuition bills to pay), I'm off to my first WorldCon in four years. Hooray! For those of you who don't know, WorldCon is the annual convention of the World Science Fiction Society, and it's held in a different location every year. This year it's in Montreal, and it is one of my absolute favorite events. First of all, it's where the Hugos are awarded, and attending members of the convention vote for their favorites. There are amazing panels with all kinds of people in attendance, from writers (Neil Gaiman is the guest of honor this year), editors and agents, film makers, scientists, mangaka, artists, and more. The masquerade is always something to see - people have constructed spectacular costumes, and every year they seem to get better. There's gaming, films, art exhibits, parties, book signings, author meet-and-greets, readings, sightseeing and (the kiss of death to my bank account) the dealer's room. Best of all are the people who attend. They are so funny, intelligent, and accepting - even though it's often crowded, and everyone's been on their feet all day, and everyone's tired - people are unfailingly kind and very rarely rude or grumpy. I am excited to see old friends and make some new ones, and to spend a long weekend immersed in science fiction and fantasy fun. I have not been to Montreal since I was a child, and I am so excited because I love visiting Canada!I had a blast at the Toronto WorldCon, so I was delighted when Montreal won the bid for this year. I am looking forward to some great food and sightseeing, along with all the SF goodness. Maybe I'll see some of you there? The above image is by Michele Laframboise, and it depicts a steampunk vision of Montreal. It graced the cover of Anticipation (this year's WorldCon)'s third progress report. Oh, how absolutely wonderful. It all sounds so fun. Hope you have a delightful time. Seriously though, have a great time. From all I've heard, it should be awesome. Cat - It starts tomorrow, and runs through Monday. I'm coming in early tomorrow afternoon. Email me at the address on my profile, and I'll send you my cell phone number. It would be great to get together! Nymeth - I wish you could come, too. We'd have a blast! Booklogged - Thank you. I'm very excited about going! Kiirstin - Thanks! I'll post about it when I get back. Wow!!! I'm so envious. Hope you tell us all about it when you get back. What a great year to go with Neil being Guest of Honor and potentially winning a Hugo for The Graveyard Book. I'd love to be there. I hope you have a marvelous time and come home with lots of goodies and good memories. I did email you - I just hope you got it! I hope you're having fun. Too bad we might not get to meet! Cath - Thanks! Just got back and it was great! VA Gal - I am uploading photos so I can post about it soon. It was fun! Thanks, Anna - it was great!